As my colleague John Stanton is away on holiday in New Zealand, I thought I’d take this opportunity to blog about John’s association with Carrolup for a period of over 40 years. That’s a serious, long-standing interest and commitment! The initial large section of this blog come from two of the articles, Search and Discovery, in the Story section of our website. 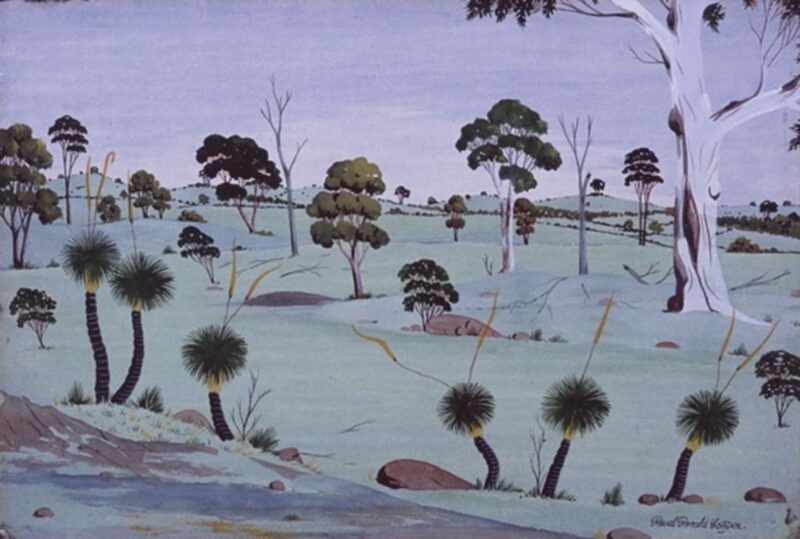 ‘Anthropologist John Stanton first learns about the Carrolup children’s art in 1976 when he sees two Revel Cooper landscapes framing Ronald and Catherine Berndt’s study door at the University of Western Australia. He reads Child Artists of the Australian Bush by Mary Durack Miller and Florence Rutter, and learns more about the Carrolup artists, and Noongar people and their culture, from highly respected Elder Ken Colbung. He is enthralled by the Carrolup Story. John helps Pat Nunn, a social worker at the Marribank Family Centre, set up an exhibition of contemporary Noongar art at the Town Hall in Katanning in 1985. They subsequently meet with members of Aboriginal communities from around the South West, who want to do something to enhance awareness of the Carrolup Story. Generous funding from the Australian Bicentennial Authority supports a collaboration between the Marribank Family Centre and the Berndt Museum of Anthropology, of which John is Director. The Carrolup Project has four goals: to document the story of the child artists of Carrolup; to create a Cultural Centre in the Old Girls’ Dormitory comprising an exhibition about the child artists and a photographic archive; for the Berndt Museum to develop a national travelling exhibition and accompanying monograph; and the production of a documentary film for television and schools. The Berndt Museum’s exhibition, Nyungar Landscapes. 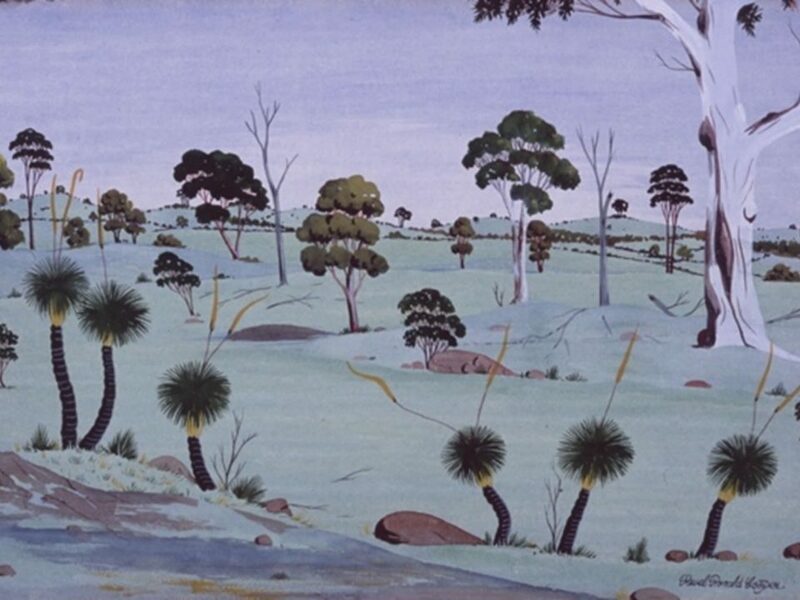 Aboriginal artists of the South-West: the heritage of Carrolup, Western Australia, travels nationally for eight years, becoming Australia’s longest-travelling exhibition at the time. Over 30 of the artworks exhibited are from the Collection kindly donated by Stan, Melvie and Gael Phillips. John learns of the missing Florence Rutter Collection when he meets Florence’s daughter Margaret Edenburg in late 1986. Margaret shows him Florence’s letter describing how she had sold her collection of Carrolup artworks to American broadcaster Herbert Mayer. Realising that Florence’s collection has gone to the United States, John starts to try and locate it. He writes to 28 institutions in New York State to ask whether they have any knowledge of the Carrolup collection. He receives no positive response. Every time he flies out of New York, John experiences a strong feeling that the art is somewhere north of the circling plane. However, the artworks remain ‘lost’. In 2004, John Stanton’s close Australian friend Professor Howard Morphy is invited to visit Colgate University in Upper New York State by the Director of Colgate’s Picker Gallery. The Gallery set aside some Aboriginal artefacts for him to look at. When Howard arrives, the Gallery Curator, Diane Butler, mentions that they have a box labeled Australian art, but she has never opened it. ‘John Stanton is working in his study when his mobile rings. He is surprised to see that Howard is calling very late at night from the States. Howard says, ‘I’ve found something.’ He pauses. John cannot believe the find himself. He is over the moon. He immediately calls Ken Colbung to pass this wonderful news on to the Noongar community. He heads off to tell Margaret Edenburg, who is by now living in a nursing home. She is old and frail, pretty much bed-ridden. Margaret is thrilled to learn that the search is now over. Please don’t forget that you can read a summary of the whole Carrolup Story, written in 12 short articles.